The Red Ring Road circles Lake Rumare and the Imperial City. The settlements of Weye, Aleswell and Pell's Gate are located along the road. It crosses several bridges, including the Talos Bridge which spans the Upper Niben, and several smaller bridges which cross the White Rose River. Many Ayleid ruins and abandoned Legion forts also border the road. 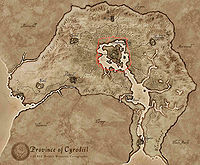 Due to its central location, the Red Ring Road connects to most other major roads in Cyrodiil. For more information, see the Oblivion Red Ring Road article. This page was last modified on 31 July 2013, at 01:21.